When Amazon recommended this book to me, I was really excited. What an interesting topic! I haven’t had good experiences with Dani Cavallaro’s work in the past, however. I felt that her books on the films of Oshii Mamoru (The Cinema of Oshii Mamoru: Fantasy, Technology and Politics, 2006) and Studio Gainax (The Art of Studio Gainax: Experimentation, Style and Innovation at the Leading Edge of Anime, 2009) were somewhat shallow and, to be frank, extraordinarily difficult to read. In these two books, Cavallaro has devoted five or six pages to films and television series to which other scholars have written thirty to forty page articles and chapters. Each of her essays reads like an outline – she skips from topic to topic with no development and little transition, using theoretical and philosophical terms without explaining what they mean in context and without giving examples. In this way, she can cover an exhaustive list of material, but it doesn’t seem like she has much to say. 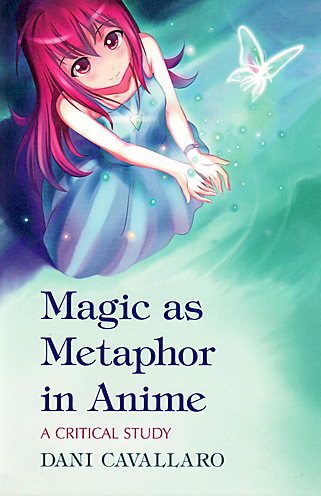 Since its table of contents would suggest that Magic as Metaphor focuses more on broader themes, though, I thought I would at least check it out from my university’s library and give it a shot. Unfortunately, Magic as Metaphor is unreadable. I found so many things about this book frustrating that I don’t even know where to begin. I suppose I should start with the least damning of my criticisms: Cavallaro discusses an enormous number of titles. Her “Filmography” section at the back of the book lists forty-one primary titles (many of which are simply successive seasons of the same franchise). She’s got roughly seventy other ancillary titles listed, however, just in case the main forty weren’t enough. Even if we focus on the main titles, though, she still has less than 190 pages to talk about thirty or so anime franchises, which equals about six pages devoted to each of them. So yes, there is quite a bit of breadth, and I admire Cavallaro for being able to watch and keep track of so many titles (many of which came out quite recently); but again, it feels like she’s writing only marginally fleshed-out outlines, and the way she jumps from title to title and from concept to concept is disorienting. It’s also almost impossible to ascertain the main point of each chapter, and the way that various anime are included in the various chapters comes off as almost random. In addition to her shallow discussions and poor structuring, I also feel like Cavallaro isn’t saying anything interesting. Certainly, she will quote key thinkers (like Tzvetan Todorov and Wikipedia) and then quickly move on without explaining what these quotes mean or how they relate to her argument, but most of her discussion is plot summary. Not explication through plot summary, but explanatory text that could be taken from an entertainment journalist’s review of a particular title. Her description of characters and themes often stems from the most simple and most obvious interpretation possible, as if it came off of the back of a DVD box. I am exaggerating, of course, but only a little bit. Certain sentences stand out as being insightful and useful and meaningful, but they are rare and isolated from one another. The writing itself is terrible, ranging from overly flowery diction (“CLAMP’s passion for ocular impairment”) to purple prose (“whereas Lydia’s expression invariably exudes infinite kindness and compassion, Raven’s holds a malevolent light soaked with unspeakable sadness”) to condescension (“Earl and Fairy makes reference to so bountiful a range of magical entities as to occasionally come across as a concise guide to the spirit world for newbies”). Her paragraphs rarely have topic sentences, and there are no strong conclusions to be found anywhere. She quotes inane movie reviews as if they were scholarship and often uses these idiotic quotes (“Sousuke is ‘one of those adorable anime moppets with large round eyes’ amid ‘many a winsome tummy-poke and nose-wiggle’”) to close paragraphs. Things like this occur so frequently that I found myself growing increasingly frustrated as I read. In short, the writing in this book toes the line between journalism and scholarship but, unfortunately, contains none of the pleasures of either. You may be asking yourself why I read the book if it was so bad. The answer is that I didn’t. I read one chapter (“Magic Bildungsromans”) and then threw the thing against the wall. It may be possible that I picked the worst chapter to read, and it may also be possible that the rest of the book is sheer brilliance, but I highly doubt it. Cavallaro has six other books about anime in print through McFarland, and all of them have been published in the last five years. These do not include the numerous other works she has published on cyberpunk through other publishers in the past five years. Simply put, Cavallaro is a writing machine, and her output indeed reads like it was written by a machine. I have found some of her work, especially Anime and Memory: Aesthetic, Cultural and Thematic Perspectives (2009) to be useful as a guide for viewing recommendations. Otherwise, it’s best to approach her books with caution, and with a library card instead of a credit card. In all fairness, Cavallaro’s books are more than capable of carrying their weight as reference guides to Japanese animation (as opposed to “critical studies”), but I myself prefer the work of British anime scholar Helen McCarthy, whose books are less pretentious and infinitely more enjoyable to read. They also have more pictures, which is always a good thing where visual media is concerned. Next Post Shojo Manga! Girl Power! “Critical Study” indeed. I hate books like that. Academic writing–or any real writing that relies on facts to support a theory–needs to have examples AND follow-through. So much of the crap that passes for literature on anime is just like this book. Shame on the author, but, really, what is the publisher thinking? I wonder. Cavallaro’s books are kind of useful as reference guides, but of course Helen McCarthy’s are much better. (I guess I should probably write that somewhere in the main post.) Also, I’m writing a review for Susan Napier’s book, and I’m trying to figure out how hers works and Cavallaro’s doesn’t…. Wow! What an incendiary review. It almost makes me want to read the book so I can groan in agreement with you. And I now understand what purple prose is. This is the first time I’ve come to your blog so I guess I should say hi! I think I’ll definitely be a regular here. I actually found this through your translation of the story with the bear by Kawakami Hiromi. I think the translation really kept the unbalanced and weird but suspiciously calm and normal atmosphere of the original. Terrible explanation, but you know what I mean? Actually, I have a question for you – how did you manage to procure the translation rights for that story? I’ve translated a few pieces from her Omedetou book, but they’ve never seen the light of day because I thought it would be impossible to get permission. If you could fill me in on how you managed that, I’d love to hear it. Looking forward to browsing back through some of your older posts. Thank you for your comments! I promise that there are better books to read and get upset about. Susan Napier’s Anime from Akira to Howl’s Moving Castle has attracted quite a bit of controversy, and it’s way more enjoyable to read. I’m hoping to post my own review of it soon. Let me see, translation rights. To be perfectly honest, I have no translation rights. I’m just an amateur translator abusing my internet privileges. I’ve posted some links to relevant websites (like this one) on the sidebar of my translation blog, and they’re probably much more helpful than my conjectures regarding the matter. If you get your own translations published, please let me know! I would love to read them. I can’t believe an editor didn’t send a letter back with the same, rather than publish the book. I hope I never have to write real book reviews for real academic journals, since I would have no idea what to say about something like this book. Especially since I have read much, much better writing in fan fiction. I was trying to think about why the publisher allowed this book to go into print. Obviously, they invested in it because they thought people would buy it, but who is the target audience? I can’t imagine academics needing this book, but it has no pictures, and the print is tiny, and it’s filled with words like “diegetic” and “heuristic” and “ontological,” so I can’t imagine that it would appeal to a general audience either. I’ve read through a couple of her books and I honestly think they’re algorithmically generated. Haha, yes! Sometimes I think Dani Cavallaro is a robot, but then I realize that even a robot would be able to write better. As someone who is, shall we say, intimately familiar with several CLAMP-related Wikipedia entries, my experience of reading Cavallaro’s book on CLAMP was one long, sustained case of deja vu. I once entertained notions of citing all of the plagiarized passages, but then I decided that it would be too much effort to spend on an endeavour that would be essentially meaningless. It’s Quite bizarre to criticize a book and say it is more like a reference and give an insigth on a so called scholar who wrote books as guides more than anything else. I am really reading it and as for the methodology chapter I think she structures very well and says where she wants to go. At least, on the first pages on explaining that she is focusing on mimetic representation and explaining what is in every little thing: saying by the other ones whose is whose and what is it for. Obviously I really feel that are many quotes and you need to deal with too much information. Although, I disagree that her prose (as far as I read) was , simply put, a blaberish and juvenile prose. If those accusations are true this would not count as an academic study. Leave alone the preferences,I think that books that are presented as studies – regarding some subjects – are really hard to put itself togeteher when there’s little reference. I am not saying that it shoul consist of an impairement for producing new studies, but sometimes they are not so well stabilshed yet. Or, some times, are there really things that deserve to be analyzed? We have to really understand those questions. I know prose and pleasure from reading are really what it matters, but when I was looking for the book what caugth my attention are certain subjects. There takes a hell out of a nerve to put up this as theme. What should be analyzed to really carry out an critical anylisis on this. I don’t know if she has raised the questioning before doing her research. Well, I think I am only defending her because you felt upset that the book is hard to read. Or at least is what you state on every one of the paragphs. I should say that the review was made as an outrage. As you didn’t like her automatic prose – as you claim – I really do not know if she (or he) is really that bad or is insiting on publishing the books because she feels like it. HOWEVERm I do agree that the book jumps into one subject to another. The bbok may be misleading when the reference is not properly put up. This is a matter that many academics texts suffer, but because they are presented to an academic audience. Obviously, it doesn’t give you an excuse for being unfocused. Well, this is only an opinion, but, frankly I am just stating that reading a book woithout reading it at all just to get furious is bad for the writer and the people who read you. I enjoy doing reviews, but when I am pissed off about a piece of anime or a bokk I rarelly state my distastefullness with the book out of the blue. I do not know really if it was your reaction, but it was what it seemed like. Sorry if I was too enfatic. After I read all the book I am going to give my on opinion on it. Hi! It´s the first time I visit your blog! I have read your article, and I am a bit dissapointed. You see, my favourite animation studio is Gainax, and I wanted a book about its works, history… etc. I hoped that Dani Cavallaro would have written that kind of book, but it seems I was wrong, because this writer has a really bad fame and I have read a bit pages of her “The art of studio Gainax…” and I can say that even in a bok about a critical study you NEED images, graphics, something. Do you know another book about Gainax with more interesting and professional content? I also saw “The Notenki Memoirs: Studio Gainax &The Men Who Created Evangelion” but it´s very expensive.